The Krewe of Little Rascals Parade annually rolls along Veterans Boulevard from Clearview Shopping Center to the end at Martin Behrman. 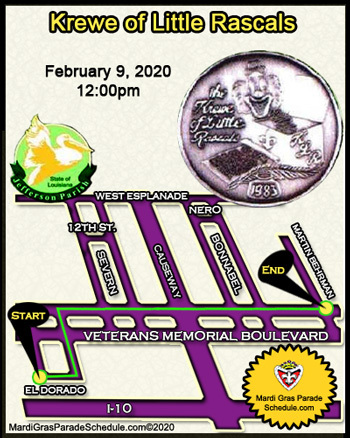 The Krewe's approximately four mile Parade makes no turns in Severn or Bonnabel. Led by the Sheriff’s vehicles and our KLR Pace Car, the Parade travels the traditional Metairie Parade Route. We include our Captains, Royalty and Krewe on full-sized McKinley Cantrell floats. Everyone riding is strapped on. All members throw to the crowds lining the street. A Special Feature is the Owens Sausage Company Horse Hitch, from Richardson, Texas. They are exclusive to the Little Rascals Parade. The Jerusalem Temple and Farhad Grotto Shriners are a beloved part of our production, along with several horse riding clubs, car clubs, and several radio station vans and special vehicles. Many schools from the Metro Area participate along with dancing schools, military bands and floats, Jimmy’s Kids and a taekwondo club. When available, the Oscar Mayer Wienermobile rides with us. The Krewe of Little Rascals is America’s longest running, most flamboyant children’s Mardi Gras Krewe in Carnival history. “Today’s Little Rascals are Tomorrow’s Leaders and Our Hope for the Future”. This is the motto of the Krewe of Little Rascals, a non-profit organization named after Hollywood’s most famous kids group. They are a youth oriented traditional Mardi Gras Ball and Parade, with members ranging in age from 4 – 19 (younger positions are available in the Court) Founded in 1983, the group is patterned after the adult carnival clubs. 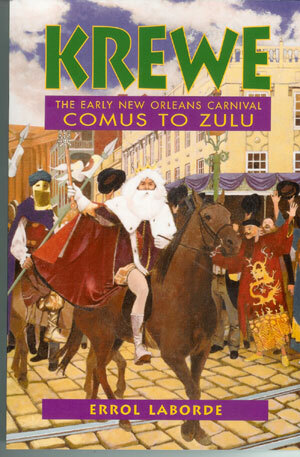 The Krewe was a vision of a couple who believed that the Carnival Spirit of the old New Orleans should live and breathe through our youth, as well as through our adults. The Krewe was built with the intention of promoting the qualities of leadership and self esteem in our young members and fellowship among our families. Little Rascals is comprised of both parent sponsored members and individual/corporate sponsored members. They believe that children should be children and ALL children should have the opportunity to achieve their fullest potential regardless of race, religion or economic background.